Shimano has released three new mono lines: Exage+, Tiagra Hyper, and Tiagra Leader. Exage+ is a fine diameter Japanese manufactured monofilament with excellent clarity and super sensitivity. It has a soft feel with low memory so it lays neatly onto the spool. It’s ideal for floater fishing for snapper or even surf fishing for species such as salmon. 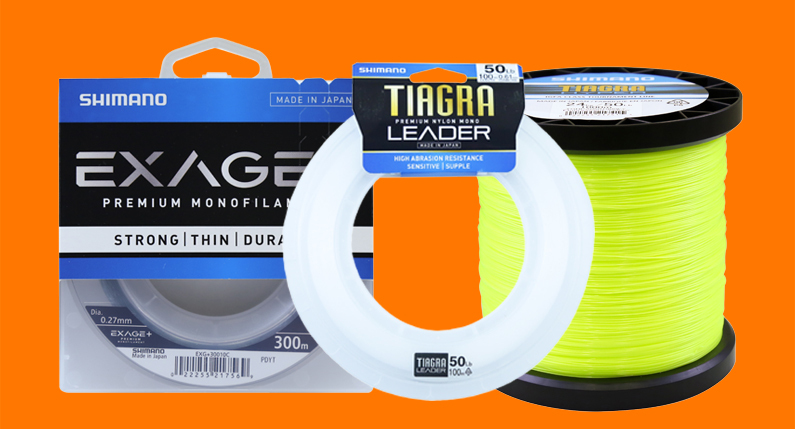 The new Tiagra Hyper gamefishing line uses premium class Japanese IGFA-rated nylon monofilament that combines high abrasion resistance with optimal stretch. It’s available in invisible clear blue and high-vis fluorescent yellow in 15kg, 24kg and 37kg breaking strains in 1000m spools (15kg and 24kg breaking strains are also available in bulk). Manufactured in Japan, the new Tiagra Premium Nylon Mono Leader is significantly tougher in abrasion resistance than standard nylon, and offers the very best in knot and crimp strength. Available in 20-150lb, the leader is suited to making rigs for snapper right through to trolling leaders for marlin.